The contrast embroidered The North Face logo on left sleeve and right back shoulder and Tonal WindWall® logo embroidered on left sleeve. The North Face® Tech Stretch Soft Shell Jacket is a great gift for executives, holidays and for all your outdoor adventures! We love this custom branded North Face jacket! Dimensions: Sizes XS-4XL (pricing includes to XL). Typical Imprint Area(s): Right chest approx. 3.5". Available Imprint Options: Embroidery, Screen. The North Face logo is embroidered on left sleeve and right back shoulder and Tonal WindWall® logo embroidered on left sleeve. For additional embroidery locations add approx. $3.00 depending on stitch count. 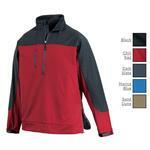 The North Face® products cannot be sold blank and may be decorated or embroidered on a pre-approved basis. 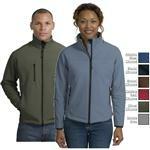 Constructed of 50% recycled polyester, this all-season, double-weave, versatile jacket promotes sustainability. 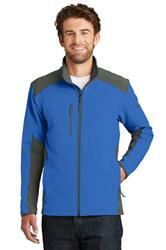 The North Face® products cannot be sold blank and may be decorated or embroidered on a pre-approved basis.